Dark chocolates with a whole Morello cherry and a liqueur centre. 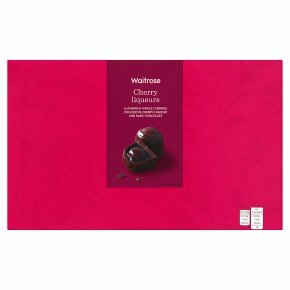 Luxurious whole cherries encased in cherry liqueur and dark chocolate. INGREDIENTS: Dark Chocolate (52%) (sugar, cocoa mass, cocoa butter, emulsifier (soya lecithin)), Cherry Liqueur (23%) (wheat glucose syrup, invert sugar, alcohol, sugar, cherry juice, invert sugar syrup), cherries (16%) (sour cherries, alcohol, sugar), sugar, cocoa mass, cocoa butter, butter oil (milk), emulsifier (soya lecithin).